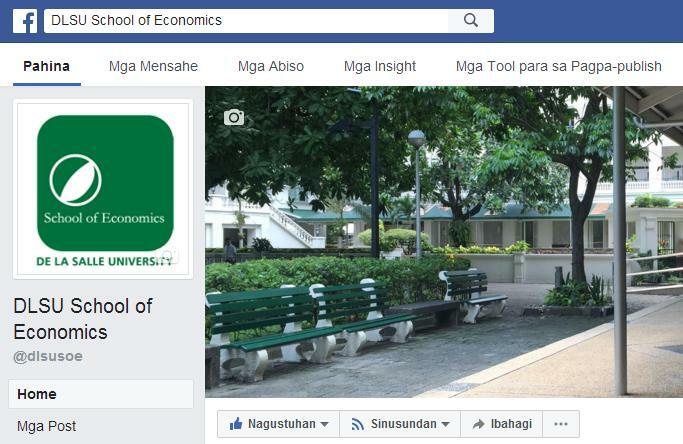 SOE pioneered many practices now considered standard within the profession: the emphasis on mathematical and econometric training for undergraduates, exposure to evidence-based research and the publication of new knowledge, development of a scientific discourse in Filipino, problem-based learning, and investment in new economic methodology. 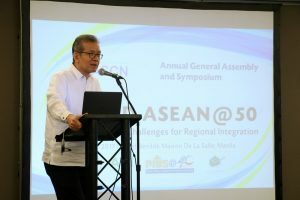 Graduates and faculty members of SOE have been recipients of renowned national and international awards and recognition. 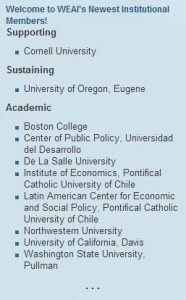 SOE have been an active participant in economic inquiry and knowledge generation: faculty members actively participate in local and international research gatherings and collaboration, and also appeared in various platforms of media. 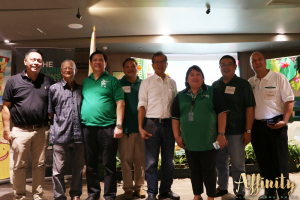 TEAM ABLE is composed of Peter Padre (APC), Adi Briones (AEF-FIN), Betty Won (AEL), Iliana Tan (CHE) and Lia Manalo (BSA) with Dr. Reynaldo Bautista Jr., RVRCOB Assistant Dean for Lasallian Mission and External Affairs, as their coach. 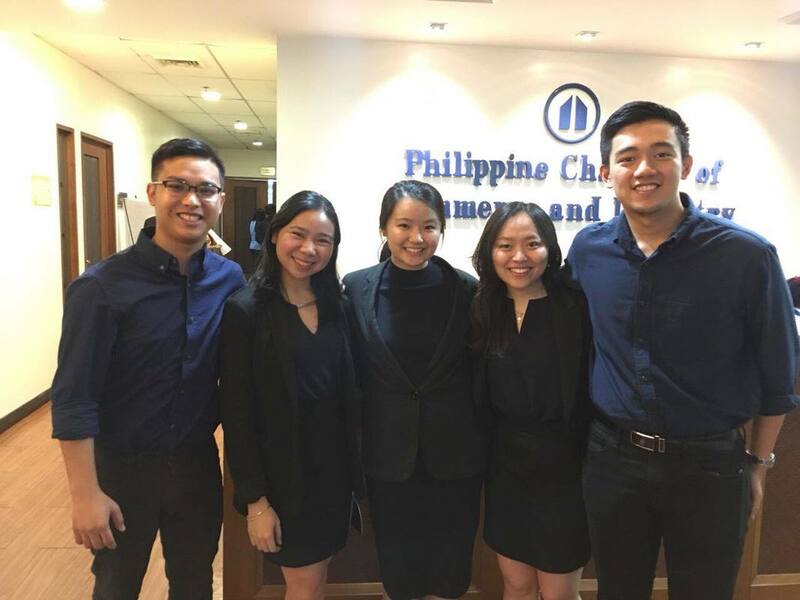 Their pitch is entitled “Felipe: Boosting the Filipino Farming Dynamics”. 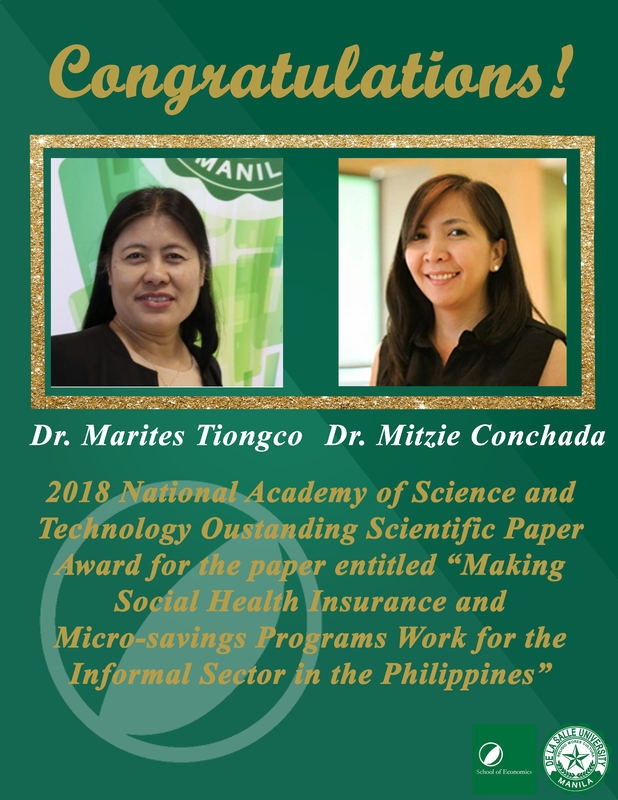 The National Academy of Science and Technology awarded Dr. Marites Tiongco and Dr. Mitzie Irene Conchada with the Outstanding Scientific Paper Award for their paper entitled “Making Social Health Insurance and Micro-savings Programs Work for the Informal Sector in the Philippines” published in the DLSU Business and Economics Review. 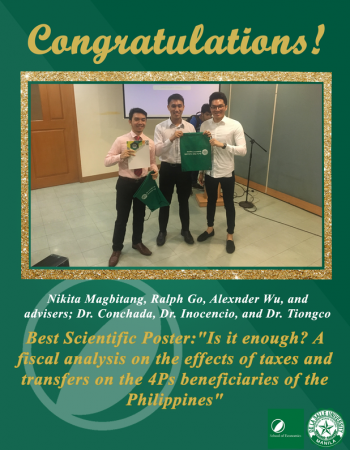 In addition, undergraduate students Mr. Ralph Go, Mr. Nikita Magbitang, and Mr. Alexander Wu received the Best Scientific Poster Award for their work entitled “Is it enough? 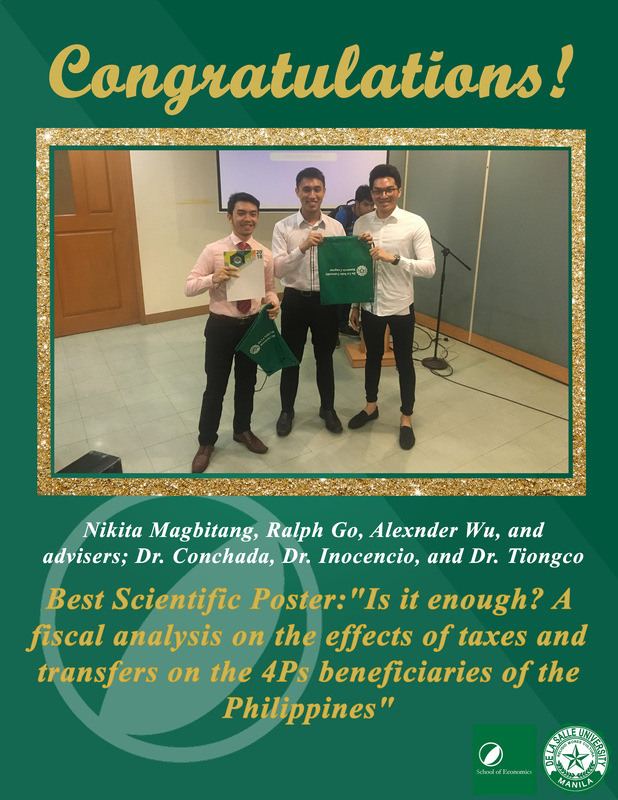 A fiscal analysis on the effects of taxes and transfers on the 4Ps beneficiaries of the Philippines” which was completed under the advisement of Dr. Mitzie Irene Conchada, Dr. Arlene Inocencio and Dr. Marites Tiongco. Congra tulations to Diane Cecilia Yu, recently graduated from the prestigious New York University School of Law. 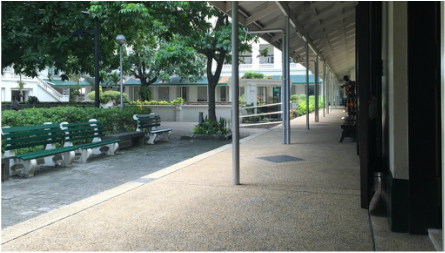 She completed her Master of Laws in International Taxation last May. She was a recipient of the Gerald L. Wallace scholarship and and is the 9th Filipino to graduate since its inception in 1996. 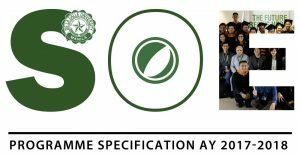 The Bachelor of Science in Applied Economics programme, for both tracks of Major in Industrial Economics and Major in Financial Economics, was assessed last March 6-8, 2018 by the ASEAN University Network – Quality Assurance (AUN-QA). The AUN-QA framework for assessment at the programme level consists of 11 criteria: Expected Learning Outcomes, Programme Specification, Programme Structure and Content, Teaching and Learning Approach, Student Assessment, Academic Staff Quality, Support Staff Quality, Student Quality and Support, Facilities and Infrastructure, Quality Enhancement, and Output. 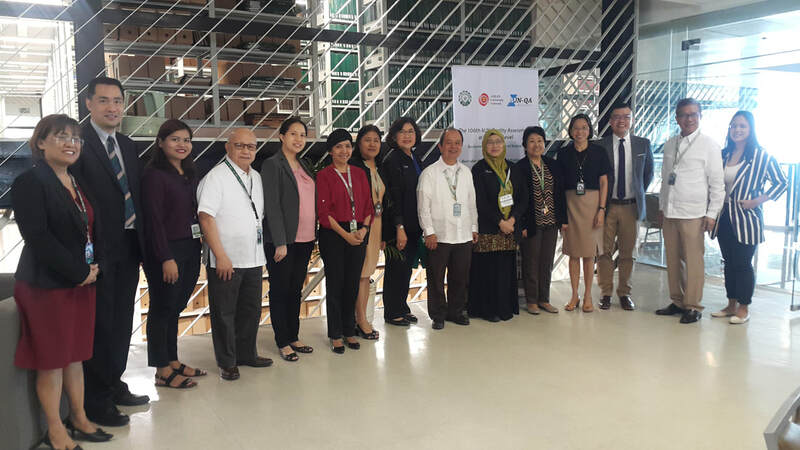 Our assessors were Prof. Dr. Hanna H. Bachtiar-Iskandar, DDS from the Universitas Indonesia and Prof. Dr. Parames Chutima from Chulalongkorn University. 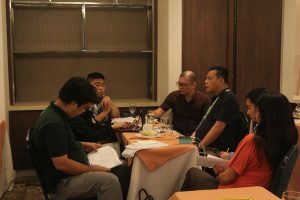 The results of the assessment will be released in May, 2018.